The era of DJs is coming back, and you’ll want to embrace it with a proper DJ turntable. Luckily for you, I’ve picked out some of the finest models the market has to offer, and I’ve made a comprehensive little guide which will tell you all you need to know about what makes the best beginner DJ turntable. Without any further ado, let’s get straight to it. Generally, the main question is whether you’ll want a plain or a complex DJ turntable. Each type has its own benefits and downfalls, and it’s up to you to decide which one you’ll handle better. Do you intend to perform live or you intend to practice and polish your DJ skills at home? Plain DJ turntables usually sound the best but offer so very little in terms of versatility. On the other side, more complex models allow you to modify your tracks live via scratch, pull, and pitch shift features. The price is not a crucial factor here. You’ll notice after a while of research that nearly all beginner DJ turntables are rather inexpensive, so money’s out of the equation. If you have the cash, I recommend going with quality pick, such as Stanton’s T55USB, and if your wallet is tight, Gemini’s TT-1000 would be your best bet. Of course, exceptions are possible, but I’ve decided to recommend the models from the lower price point categories as they are better suited for beginners than pricier ones. A flimsy turntable is usually a rotten investment. You’ll notice that even the cheapest turntables are usually around $100, so getting a model which doesn’t exactly excel in this field will call for a replacement sooner rather than later. You don’t need to look for rock-solid turntables – just skip out on plastic, obviously flimsy models and you’ll do just fine. Basic Beginner DJ turntables are outfitted with a set of basic features such as volume control and selectable speeds in most cases. On the other hand, more complex models come with digital displays, pitch shifters, and similar features. Some digitalized models even feature special knobs that allow you to navigate through tracks more easily, a good example of such a turntable is DJTech’s USOLOE. Let’s start off easy. Geimini’s TT-1000 is a plain belt-driven turntable which is ideal for beginner DJs for several reasons. First of all, it’s very cheap, which gives you a great opportunity to check out how the most basic DJ turntables work without having to invest too much. Even though it’s rather inexpensive, don’t get the wrong idea – it’s not as flimsy as it looks like. In fact, this turntable is made of high-quality materials and features a platter made of solid aluminium. Among the DJ features that should be of interest to you, the TT-1000 comes supplied with dual soft-touch start & stop buttons, a variable slider (plus and minus 10%), and adjustable counterweight and anti-skating controls. On the downside, this turntable isn’t as versatile as, for example, Numark’s PT01, and it lags a bit behind Stanton’s T55USB in terms of audio quality. Nevertheless, it boasts a huge value for the price for immediate beginners who are yet to experience a DJ turntable firsthand. Overall, it’s pretty cheap, decently sturdy, and it does a good bang for the buck. I recommend that you try it out if you have a tight budget, otherwise consider other picks in my review. DJTech makes specialized DJ turntables, and I’ve picked a model from their assortment which is ideal for beginners just for you. The USOLOE is a digital turntable, as you’ll come to notice, as it features a modernized display which gives you real-time feedback on which settings are in effect (song name, length, and such). It’s great for DJs in the making for numerous reasons – it comes with a USB input, 3 hot-cue memory banks, 25% pitch shift slider, seamless loops & reloops, and multi-function knob which allows for easy navigation. Firstly, let’s discuss the “USB” part. This turntable accepts USBs, as well as smaller hard drives, which greatly simplifies the track selection process. On top of that, the hot-cue banks allow you to instantly play and switch between songs, making it perfect for live performance. The pitch shifter and key-lock features are your to toy around with, and they’ll give you the means to polish your fresh DJ skills with ease. What’s more, the multi-function knob is all you need to navigate between tracks and main functions. Lastly, DJTech’s USOLOE doesn’t cost a fortune. Surely enough, my previous pick (Gemini’s TT-1000) costs even less, but this model belongs to the same price point category and sports a huge value for the cash. Even though it excels in numerous fields of performance (such as audio quality, DJ-based features, and versatility), it’s not exactly durable. Of course, with proper handling you’ll be able to use it for years, if not even more, but nearly all digital turntables are flimsy in nature. 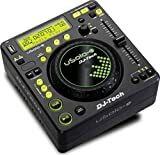 All things considered, this is a powerful and versatile DJ tool best used by beginners, as it’s not too complex or too plain and brings a lot to the table without asking for much in return (moneywise). Numark makes some of the finest turntables you can find on the market, and for the purpose of my review I’ve picked out their PT01 Scratch. Plainly put, it looks awesome, comes packed with top-shelf features, and it’s as stable as it is durable. First things first, this is a 3-speed turntable which can reproduce vinyl records ad 33 1/3, 45, or 78 rotations per minute. It also features a built-in Scratch and Slide switch, which makes your job as a DJ pretty plain. Among other integrated features, the built-in speaker is worth mentioning. It’s strong and great for practice, although you may need to amp it up if you want to perform live with PT01. Other built-in features include the protective case, as well as the carry handle for easy transport. What’s more, the carry handle makes PT01 one of the most portable DJ turntables in the price range. The PT01 works on batteries (it requires six of them), but alternatively you could use an AC adapter to power it up. Luckily, you’ll get one as a complementary feature. The volume controls are very easy to use, and as for connectivity, you can use Aux ins, RCA line outs, or USB to record on your PC. In all truth, Numark’s PT01 is an excellent beginner DJ turntable which definitely deserves consideration. I’m closing the curtain down with Stanton’s T55USB belt-driven DJ turntable. Even though it looks very modern and exquisite, it’s actually pretty plain and bears a lot of semblance to Gemini’s TT-1000. Both of these models are simple DJ turntables tailored for beginners, and both of them are outfitted with a humble configuration. The real difference, however, lies in the quality of audio emissions. Stanton’s T55USB boasts unparalleled sound quality, and it’s one of the turntables you’ll want in your inventory when you decide that it’s time to shine. Most people claim that T55USB’s cartridge is audiophile-level – it makes sure that the border between this turntable and all other models is clear and stable. The only actual DJ feature you’ll get to use is the adjustable volume slider – as a beginner, you don’t want things to get too complicated, so you can focus on your tracks and mixing them rather than performing live in the first place. The only potential downside is that T55USB costs a bit more than most people would like. 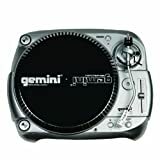 Even though it’s just a couple bucks above Gemini’s T1000 or Numark’s Scratch, it belongs to a higher bracket of the same price point category. Regardless, it does an amazing job for the money. Finding the best DJ turntables for beginner isn’t so hard. It’s true that the market is full of them, and sifting through millions of products will take some time and effort, but luckily, I’m here to help you out and narrow your selection down a bit. I hope that you like my recommendations, and I wish you all the luck in finding a turntable which is best for you. Is the Stanton T55USB a good middle range? I want something that is on the cheaper side but still packs all the features one would expect from a turntable. I know I won’t get all the bells and whistles at this price but I am still a beginner so I don’t want to spend a lot anyways.